The spacious Coral Sea Villas are self-contained and can comfortably accommodate a maximum of eight persons. 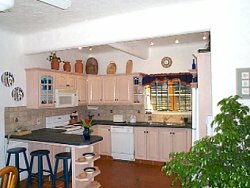 On the ground floor of each villa is a fully equipped kitchen complete with all appliances and an adjoining breakfast bar. 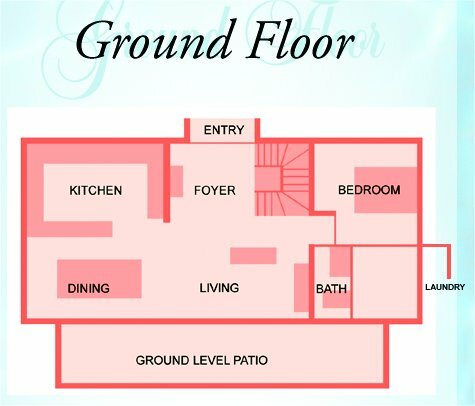 There is an airy open-plan living and dining room which leads directly onto the patio. The patio area with its high ceilings and fans is perfect for al fresco dining and even includes a barbeque grill. 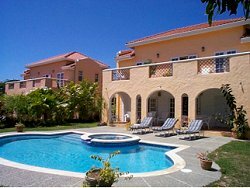 These villas are located just around the corner from the turquoise waters and white sands of Pigeon Point and Store Bay. 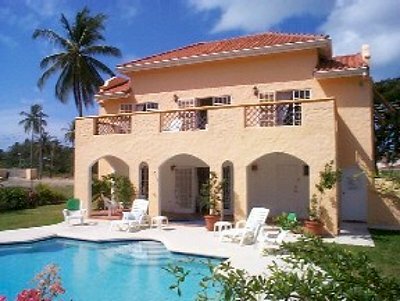 These Spanish design villas are situated amongst the foliage of the Bon Accord Estate on the southwestern side of the island offering ideal location to numerous activities and close proximity to various restaurants. Coral Sea Villas offer the best of relaxed island living. The characteristic uneven finish of the walls and lofty ceilings expresses its Spanish architecture yet these villas offer all the amenities required for a relaxing tropical holiday. Each of these villas is set in its own private garden accompanied by its own swimming pool . Unique tropical furnishings and cool floor tiles gives each villa a character of its own . 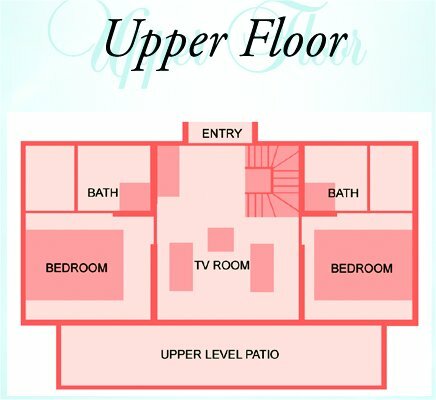 All three bedrooms offer you air-conditioned comfort. 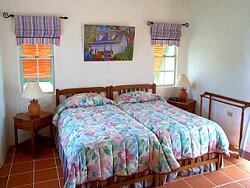 On the ground floor you will find the first twin-bedded room, cozy and brightly decorated, giving the room a tropical feel. 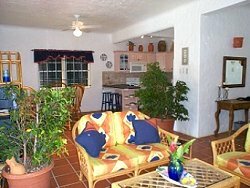 Conveniently adjoining it is a full bathroom that can also be accessed directly via the poolside patio area. The decor of the first floor adds to the villa's Caribbean ambience. Here the master and third bedrooms are separated by a spacious television 'nook' whose two futons can sleep two persons quite comfortably. 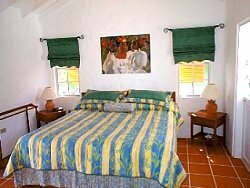 The master bedroom is furnished with a king-sized bed while the second bedroom has twin beds. each of the first-floor bedrooms has its own en-suite bathroom. From the upstairs bedrooms French doors open onto the balcony offering a delightful view of the the colorfully landscaped gardens, free form swimming pool and jacuzzi. Villas come with cable television, telephone and music center to help you unwind and make your holiday moments even more special! You will be warmly welcomed upon your arrival by your personal housekeeper who will ensure that all household duties are taken care of while you are vacationing with us. Special services such as catering and babysitting are available upon request. Cribs and rollaway beds can also be arranged.